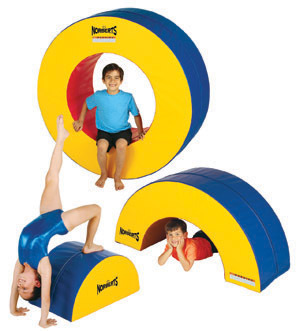 Gymnastic Mats - Fundamental Mats - Donuts - Norbert's Athletic Products, Inc.
All Donuts, Donut Halves and Rockers are NOT created equal. That's because we fill Norbert’s Round Donut Halves with something special: a core of 70 ILD prime polyurethane with a layer of 1.25" thick crosslink on either side to increase stability and minimize foam degradation. Norbert's Round Donuts and Octagon Donuts are filled with solid slab 55 ILD prime polyurethane foam filler. All of our donuts are covered with extremely durable 18 oz. vinyl-coated polyester material. After comparing ours with theirs, we’re sure you’ll agree Norbert’s Donuts, Halves and Rockers are a pretty sweet deal.